A Norwegian duo sets sail with an old-school epic on the high seas. 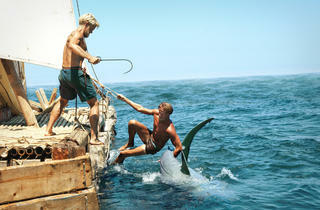 GOING TO NEED A BIGGER BOAT Crewmates have a tail to tell in Kon-Tiki. It takes a certain kind of person to build a wooden sea vessel according to centuries-old specifications and sail it more than 4,300 miles across the Pacific Ocean, just to prove a theory. It also takes a certain kind of filmmaker (or in this case, filmmakers) to make a movie about that real-life adventure—not just any movie, mind you, but a vintage, Old Hollywood–style epic that captures the sheer scope of such a voyage. Thankfully, Norwegian directors Joachim Rønning and Espen Sandberg fit that second bill to a tee, and the duo set out to tell the story of Thor Heyerdahl, a Scandinavian scientist who took a skeleton crew from Peru to Polynesia in 1947 on little more than a balsawood raft, in the manner it deserves: a grand boys’ adventure, full of brave men, hungry sharks and Saturday-matinee derring-do. 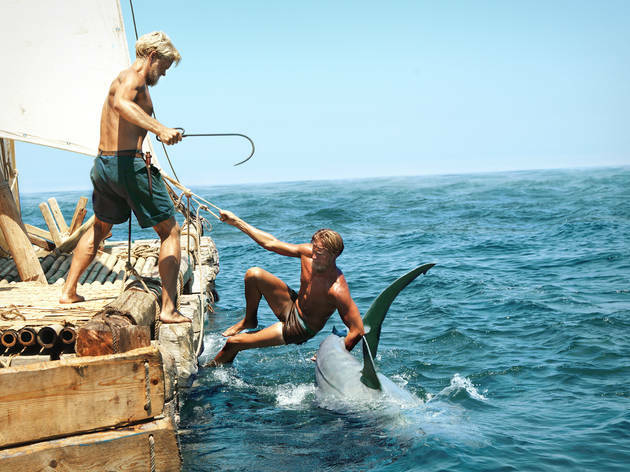 The result, Kon-Tiki, is the most expensive Norwegian film to date, garnering a Best Foreign-Language Film Oscar nomination and a distribution deal from the Weinstein Company (though the film American audiences are viewing is a slightly different version; see below). Time Out New York talked to Rønning, 40, and Sandberg, 41, over the phone, whereas they discussed their lifelong admiration for Heyerdahl and their love of movies that fill a big screen. You both grew up knowing Thor Heyerdahl’s’s story and the tale of the Kon-Tiki voyage, right? Espen Sandberg: …playing around with his dad’s video camera, but nevertheless. Joachim Rønning: Well, we’re still basically just playing around in the backyard together, Espen! Espen Sandberg: The toys are just bigger and better now. Joachim Rønning: In any case, Thor Heyerdahl was the only Norwegian to ever win an Academy Award, for the documentary he made about the trip [also called Kon-Tiki, 1950]. He wasn’t just some courageous explorer; he was a filmmaker, which is what we wanted to do with our lives! Thor was a huge inspiration to us. Espen Sandberg: We’ve always been attracted to epic stories, and his story is something that deserves a very large canvas. That was a big reason as to why we really wanted to make this particular movie: We didn’t want to just pay tribute to this man, but to the huge endeavor that he went through. You know, there is so much great drama on television now—but we love cinema. Joachim and I were both determined to tell his story in the hugest way possible. It felt like a calling. Joachim Rønning: …we had to prove we could make this giant film. Whenever we had doubts about taking on such an enormous task, we thought, Here was a guy who couldn’t swim and was terrified of water. Neither of those things stopped him from tying nine logs together and drifting across the world’s biggest ocean. It made us want to know this guy better. It feels like you either have to make this film like Werner Herzog would, i.e., build the exact raft and sail it across the exact same route, guerrilla-style—or do a big, old-school Hollywood epic. Joachim Rønning: Espen and I grew up with Hollywood movies of the ’70s and ’80s; those kind of movies are a big reason of why we wanted to become directors in the first place. There’s so much great drama on TV right now—but we love cinema, and we love the kind of cinema that just completely overwhelms you. It’s funny, we’ve been in Los Angeles for a bit now, and other filmmakers here keep telling us that Kon-Tiki has this very classical Hollywood feel to it. Espen Sandberg: When we were discussing the look and feel we wanted, we kept going back to Lawrence of Arabia and movies of the time period. The types of widescreen movies where the horizon is very prominent in shots and you can really feel a sense of scope, which David Lean really did better than just about anybody. How did you and the cast hold up while shooting on the open seas? Joachim Rønning: Thankfully, we only shot in the water for four weeks or so. Everyone warned us against it, and we didn’t really have the budget to bring a huge crew out there with us. Basically, there were 20 of us out there on the boat, including the actors. It was daunting going into those scenes, but looking back on it now, it was the most magical part of the production. The cast really had to learn how to sail that raft—which was the same vessel that Thor’s grandson Olav had built to sail from Peru to Polynesia in 2006 and lent to us for the production—and it gave you a much more realistic sense of what these guys had to endure. You mention the budget, and there’s been a lot of press about how, in order to get a decent amount of financing to make this an epic, you had to simultaneously make the film in Norwegian and English. Can you talk a little bit about how that process worked? Espen Sandberg: Thor Heyerdahl himself really wanted the film to be made in English. Our producer, Jeremy Thomas, had been working on this project for a very long time, and before he passed [in 2002], Thor had requested that any film made about the journey be made that way. He always considered himself a man of the world, and that English was the universal language. Joachim Rønning: But that said, there were some financial considerations that allowed us to get a bigger budget if we shot two versions simultaneously. We were lucky in that we had very motivated actors; the process was usually we’d do several takes of a scene in Norwegian, then do a take in English. Occasionally, we’d go back and shoot one more take in Norwegian if we came across something interesting in the English take. Most Scandinavians are pretty fluent in English to begin with, because we learn it in school at an early age, so it wasn’t like the cast had to learn a new language. Espen Sandberg: Harvey Weinstein could have just dubbed the Norwegian movie into English, but he didn’t. He liked the English version as it was. Are there any serious differences between the English-language version and the Norwegian version? Joachim Rønning: Oddly enough, the English version moves quicker, simply because the English language is a little bit more efficient. Espen Sandberg: It actually made the movie shorter. How did you approach shark scenes? There’s an amazing sense of the real and the digital blending together seamlessly there. Espen Sandberg: We found all the sharks through a Scandinavian casting agency. [Pause] I’m kidding. Joachim Rønning: We were really nervous, because we shot the film with the actors playing off of nothing, and had to rely 100 percent on the computer animators to give that scene a real sense of danger. We worked on the film for five years, and we had never really seen a digital shark in any other films that looked the least bit photorealistic. Our postproduction team worked around the clock for close to a year to get everything right, and the first time we saw the footage, we thought, My God, they actually did it. Espen Sandberg: I remember being very emotional after seeing that finished footage for the first time. I thought, Wow, we actually pulled it off. This could end up as good as we imagined it could be.